The NTRA, DRF, and NTWA announced the 2009 Eclipse award for photography this afternoon, and there was something about the winner (below right), taken by Jeff Taylor at the Blue Ridge Hunt Point to Point Races for the Winchester Star, that felt familiar. But what? Oh, that’s it — a similar photo by Douglas Lees (above left) won in 2007. 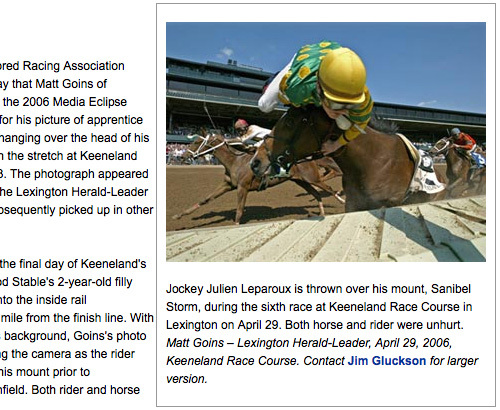 Goins won again in 2008, with a picture of jockey Frankie Dettori leaping from Donativum in the Breeders’ Cup winner’s circle. Curious, that the Eclipse judges change each year, but that their taste for jocks in air — falling or jumping, falling while jumping — does not. So annoying that in a year filled with historic and spectacular racing that the judges go for sensationalism. A friend pointed out that racing media usually doesn’t give steeplechase the time of day but come eclipse photo award time you’re likely to see a steeplechase spill. The Eclipse photography award voters must also be selecting some of the racing footage for Animal Planet’s “Jockeys.” Guess they’re trying to sensationalize horses breaking down and/or jocks getting thrown off their mounts. Going on evidence from the past few years, your friend has a point. What I don’t understand about the photography award is how it’s been so off the mark for several years. Going back to 2004, the trend has been for gimmicky or sensationalistic photos. Is the problem in the submission process? The judging? The difference between Marten’s flying dismount and Goins’ is that Marten’s is infinitely better. His is at a better point in the leap and has “Muttonchops” in the background mimicking Dettori’s right along with him. Nothing against Matt, but it’s just not nearly as good. This year’s winning photo is a terrible disappointment. So many great moments in racing this year and NTRA continues to choose tragic moments of individuals getting injured and duplicating the scenes. The same photo won in 2007. Hello???? There is nothing special about that photo AT ALL. Agree Marten’s shot is far better and thanks for linking to it. My point was simply that this is not the first time the judges have gone for very similar images. Thanks, Anon @ 9:28, for the link to Marten’s photo. You’re right, by any measure — editorial, technical, artistic — it’s a superior shot. I found the photo interesting to see clip along the horse’s rump. But it leaves me chilled and nauseous. Not for any documentary or aesthetic reasons but because my nephew Michael Straight may well be paralyzed for life due to a fall from a horse during a race. Eclipses for photos like this are merely part of the “blood and circuses” approach to racing coverage and recognition that leave me cold. Plain old “bread and circuses” is enough for this writer. I write this not in critique of the photographer but of the judges’ selection. i know mick — that’s mike marten — and he is a superior photographer. that a flying jock or falling horse would be the recent trend for an award is so simplistic that the sensationalistic attributes to it are passe. the people that judge these awards should be photographers with a racing background, so please don’t tell me these judges were. Fiona, you bring up an excellent point. 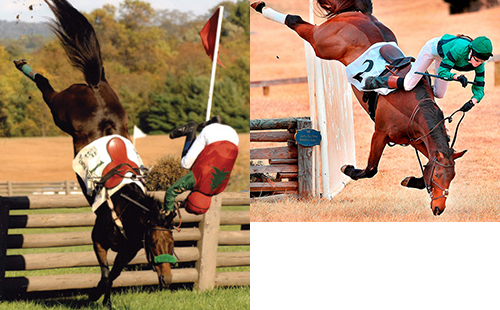 The captions or context provided for these photos always point out that horse and rider came up uninjured (thankfully! ), but a picture of fall is still unsettling, and seeing such a photo honored even more so. It trades on the danger on racing and at the same diminishes that danger. It is chilling. Best wishes to your nephew and family. It was heartening to read that some movement has returned to his toes.